Thank You! Your commitment to fundraising supports the Canadian Mental Health Association’s mission to create understanding, dispel the stigma and promote recovery associated with mental health issues. Packages include a rudimentary map, que sheet and t-shirt if you registered before May 31. You can pick up this package during registration June 24 between 7-730am. Registration will run from 7-730am the morning of the event, June 24. It will be located at Old Yale Brewing, 44550 S Sumas Rd #404, Chilliwack, BC V2R 5M3. There will be NO coffee at the start locatin. To combat this blatant disregard for humanity, we’ve mapped out an excellent coffee stop merely 22km and one small hill into the ride, Hazel Springs Bakery! Here are some fundraising tips that will help you raise funds from your friends, family and co-workers: Send an online letter to friends, family and co-workers asking for their support. Add in the link to the donation page through CCN to make it easy for them. Donations made this way go directly to the CMHA and will receive a tax receipt. Did you know it takes approximately four requests before a person makes a donation? People can only make a donation if you give them an opportunity. Don’t be shy about asking more than once. Send an email to announce your participation, a second email to ask for donations and an update email with a follow-up phone call, if possible – it’s hard to say no over the phone! The more you put yourself out there and share your story, the more your donors will feel connected to it. Use status updates on Facebook, Instagram, Twitter and/or Linkedin to update friends on your fundraising progress. Provide a direct link to the donation page. Most importantly, jumpstart your fundraising by making a personal donation to show your commitment to the CMHA at CCN. 12:00 pm First riders finish the 100km distance – beer time! 3:00 pm First riders finish the 200km distance – beer time! 6:00 pm Final riders find the beer! There will be NO road closures. Please treat this ride with the same level of safety as you would a regular weekend outing. FREE event day parking is available in the parking lot behind Old Yale Brewing. 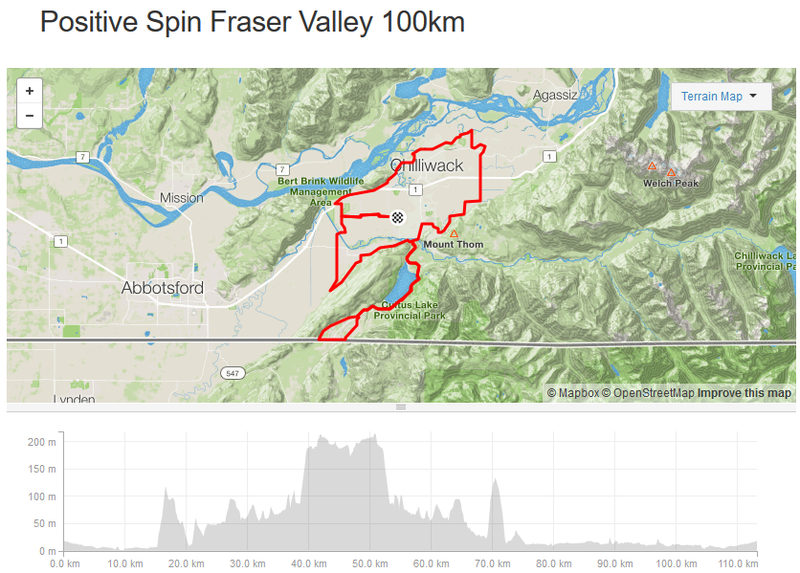 **Positive Spin is on an UN-MARKED course. Download the route files and know where you are going. Both routes can be found on Strava via our website. Each distance will have pace groups to join for the day. There will be one no-drop pace and one faster pace per distance. This is not mandatory but the routes are challenging and it’s more fun to ride as a group! There will be 6 locations (for the 200km distance) and 3 locations (for the 100km distance) with Feed Zone support. These areas will have water, hydration drinks, pop, fruit and various snacks. On top of these areas are local business’ that can provide anything you require. These can be found on your que sheet that you will receive the morning of. While these will be available, please be as self-sufficient as possible. Bring extra food, 2 water bottles and the ability to fix minor repairs such as flats. A sweep vehicle will be driving the course. If you run into any problems out there, you won’t be left stranded! If you’re concerned about food, water or support please join us in one of our guided groups for the day! Washrooms will be available at the start and finish of the ride as well as on course where marked on your que sheet. For calls of nature outside of these areas, even though we are in more remote areas, please be as discrete as possible. Participating in a group ride implies an informal contract. You are part of a group. Each member contributes to the wellbeing and functioning of the group as a whole. 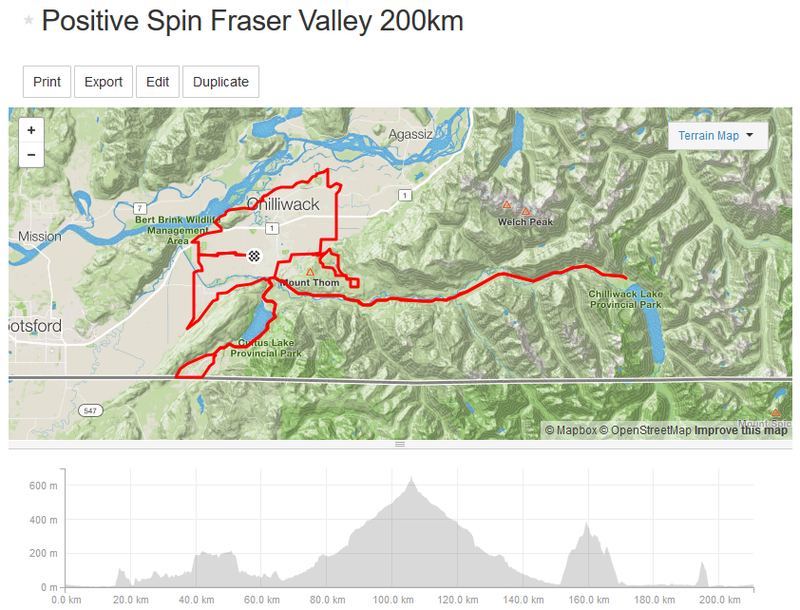 We will have 3 groups of varying speeds available to ride with lead by Positive Spin team members. You’re able to join one of these groups or simply create a team of your own. Either way, the rules of the ride and rider responsibilities need to be understood and executed. 2 Helmets, ID, and medical and emergency contact information are mandatory. 3 Use of earbuds, headphones or cell phones while riding is not permitted. 4 “Share the Road” is a two-way street; act with respect and courtesy to all others on the road. 5 Ride predictably so that others can anticipate your movements and respond safely. Announce Hazards: When riding in a group many cyclists may not have a good view of the road surface ahead because of the riders in front of them. It is important to indicate hazards by pointing to them. You may also want to shout “Hole!” or “Glass!” or “Rock!” etc. especially if you didn’t spot the hazard until the last second. Generally an alert rider at the front should have time to warn those behind simply by pointing at the hazard. As cars approach, shout “Car back!” or “Car up!” and maintain your position as far to the right as is reasonable. When you are the last rider in a group, watching for vehicles approaching from the rear and calling “Car back!” is your responsibility. Change Positions Safely: If you want to pass, do so on the left and say “On your left!” to warn the cyclists ahead that you are passing. Sprinting around the group while a car is about to pass is dangerous; don’t try it. If you have questions or issues while out on course, here’s who can help you out. by raising funds for the CMHA’s support and services. It’s great that you are using your personal challenge to make a difference! Positive Spin can be found on various media sites, join us! Thank you for taking the first steps with us!